Eric Trump Attacks "Disrespectful" George Conway - Joe.My.God. 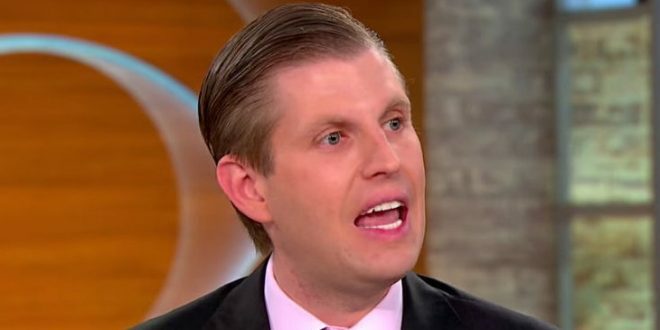 President Trump’s son Eric Trump on Monday accused George Conway of showing “utter disrespect” towards White House counselor Kellyanne Conway, his wife. Conway has been publicly criticizing Trump, his wife’s boss, for months. On Monday, he suggested in a tweet that Trump was tampering with witnesses in special counsel Robert Mueller’s Russia investigation. Conway, a lawyer, has organized a group with the goal of urging fellow conservative lawyers to speak out against the Trump administration’s actions. You’re a Trump, boy. You cannot criticize another man’s marriage unless you’re preparing to enter a monastery and devote your life to celibacy, meditation, and prayer.